A portrait of an initiated youth holding the horn and nasal septum of an ox tethered to a post. On initiation youths were given an ox by their father, from whom they took a name based upon its markings or other attributes. This name was then used by his age mates and gradually by others also. Based on the film number, this photograph was probably taken at Mancom village among the Gaajok. Note on print reverse ms pencil - "83 2" & print front border ms ink - "NUER X/54"
Morton, Chris. 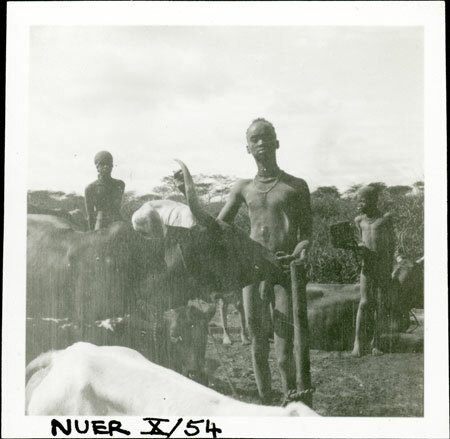 "Nuer youth with ox" Southern Sudan Project (in development). 03 Jan. 2006. Pitt Rivers Museum. <http://southernsudan.prm.ox.ac.uk/details/1998.355.475.2/>.